So the next time you need stamps, consider purchasing these. 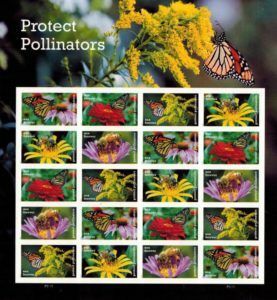 On the side of the stamp is the “Protect Pollinators” title as a reminder. This entry was posted on Saturday, September 9th, 2017 at 7:59 pm	and is filed under Earth Day, Every Day, Home Page. You can follow any responses to this entry through the RSS 2.0 feed. You can skip to the end and leave a response. Pinging is currently not allowed. I already bought mine. Beautiful stamps.!! !